Published: Nov. 27, 2012 at 05:55 p.m. Updated: Nov. 27, 2012 at 06:12 p.m. Things keep getting worse for Andy Reid. This can't end well for the big man. Here's a list you don't want to be on. 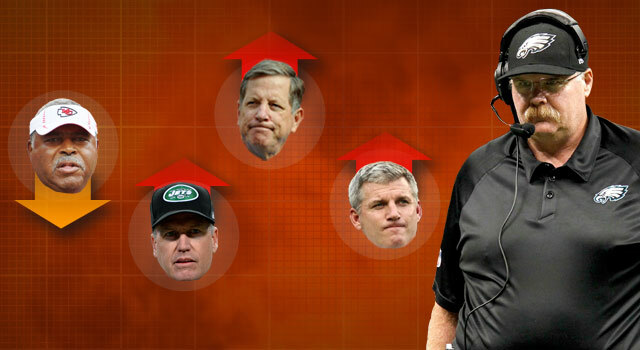 Every week, Around The League breaks down five coaches whose seats are warming as the weather cools down. Is your coach feeling the heat? Pretend you didn't see the illustration above and find out. The Phillies have won a game more recently than the Eagles. Nick Foles isn't impressing anyone. The defense can't even grasp "high school" concepts. We've peeked over the horizon ... and it's an apocalyptic wasteland. This week on That's Norv!, the Chargers need only a stop on 4th-and-29 to keep their playoff hopes alive. Coach is dumbfounded as his entire defense fails in spectacular fashion, dooming him beyond a shadow of a doubt! The elderly (and people, um, beyond elderly) are just two of many groups getting after the Chiefs these days. To Crennel's credit, his team at least put up a fight against Peyton Manning and the Denver Broncos. Munchak has to feel like he's running out of time now. He lost to a previously one-win Jacksonville Jaguars team on Sunday, then fired his offensive coordinator Monday. With owner Bud Adams running short on patience, you can guess what's next. How could Rex's seat not be feeling a little toasty after that calamity against the New England Patriots on Thanksgiving? If Ryan did get fired, there is a notable job opening at the stadium. The downsides: There's no pay and drunk people will try to fight you.